Dave Jenkins has had the Islands in his heart since his school days in sunny Florida where he began surfing and playing music in 1964. He was listening to anything from the Beach Boys and Jan and Dean, to Aretha and Marvin Gaye. His surfing influences were men like Fred Hemmings and Joey Cabell, Corky Carroll and Mickey Dora. Hawai'i was the dream. In 1966, Dave moved west to California, and began playing clubs and concert halls, and working in music stores. In 1973, Dave and musical partners, Corey Lerios on keyboards, and drummer Steve Price, teamed up with bassist and singer, Bud Cockrell, to form the California lifestyle band, Pablo Cruise. On A&M Records, Pablo Cruise recorded seven LP's and their rockin' Island sound found its way to the national airwaves. From "Ocean Breeze" and "Island Woman" on the debut album, to radio hits "Love Will Find A Way", "Whatcha Gonna Do", and "Place In The Sun" among others, Pablo Cruise established itself as one of California's great 70's bands. 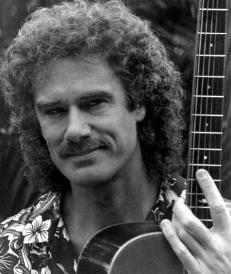 Dave's first visit to his dream Hawai'i was with Pablo Cruise in 1978. Today, you still hear Pablo Cruise with the voice and guitar of Dave Jenkins on the radio. In 1987, Dave joined former Doobie Bros. drummer, Keith Knutsen, and guitarist, John McFee, and Credence Clearwater bass player, Stu Cook in the hard drivin' country rock band, Southern Pacific. Their '87 - '88 Warner Bros. LP entitled, "ZUMA" (named after the southern California beach where they surfed) contained three big country radio hits, "Midnight Highway", "Honey I Dare You", and "New Shade of Blue", which went to #1 on the Country top 100 charts. After two years of solid touring and lots of television appearances, Dave left the band to pursue his own endeavors. 1989. Enter Kapono Beamer. Through an introduction by famed environmental artist, George Sumner, Dave and Kapono immediately hit it off and began writing music together. Dream Hawaii was becoming a reality, and the chance to write and sing with one of Hawaii's favorite sons was a great opportunity. So, surfing in the morning, and writing and recording the rest of the day has been the schedule on Dave's composing visits to Kapono's recording studio,"Pueo Sound", at his home in Honolulu. This has led to "Cruisin' On Hawaiian Time", a collection of songs dedicated to the Islands that Dave loves so much. "Cruisin' On Hawaiian Time" is the first release from Kapono Beamer and Dave Jenkins on Luster Bros. Records. It's also what Dave has in his mind for some time to come.